It was goals, goals and more goals for Aycliffe Juniors this week as the season comes to a conclusion. More great news as well with the Under 18’s ‘Blacks’ being crowned League Champions this week. 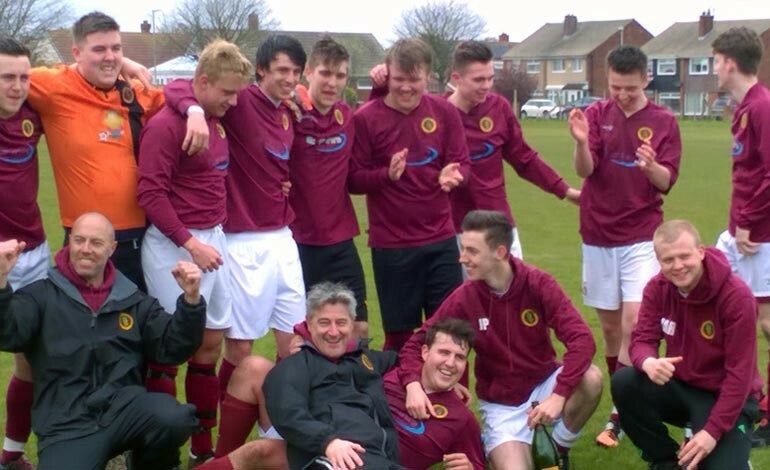 The Under 18’s finished their season with a huge 16-0 win against Seaton Carew after beating third placed Darlington Spraire Lads 3-0 in midweek to open up an unassailable lead at the top of the table and seal the league title. They have lost only 2 of their 18 league games scoring more than a hundred goals in the process. Their top scorers Taylor, Hansom and Raisbeck dominated the league scoring charts with each of them in the top 4 scorers only separated by Peart from the Aycliffe Reds team. Fantastic effort from this team and their coaches Joe and Dean. From one of our oldest teams to a new side, our Under 6’s who played their first game on Friday evening against a strong Darlington team. The squad played brilliantly and really enjoyed the experience, particularly when celebrating their first goals! The Under 8’s concluded their league season on Sunday with a 5-0 win against Middleton Rangers. The Under 10 TJFA league team finished off their championship winning campaign at home against Seaton Carew and sealed a great 4-0 win. Charlie was in fine form with two goals which were added to by Lucas and Jacob to ensure the victory. This gave them a record of 16 wins from 18 games scoring 67 goals and conceding only 10. This is testament to the scoring prowess of Lucas and Zack who each got 20 goals or more as well as the great efforts at the back from goalkeeper Tom along with Aaron, Harry, Charlie and Chloe who have been the mainstay of the teams defence. The Under 11’s won 9-3 at home to Richmond with Charlie Cayless among the goal scorers. The Under 14’s concluded their season with a derby game against Aycliffe Youth, they headed in to this final league game full of confidence from last weeks win. They started nervously but then settled to put in a fine team performance. The passing was good, defence solid, midfield inventive and the forward line deadly as they ran out 12-1 winners. Goals came from Burrows (7), Pattinson (2), Dunn, Barnes and Imelia. The team have now won their last three games to end the season strongly as they now look forward to end of season trip to Scarborough where they will be joined by the Under 8’s and 10’s over the Spring Bank Holiday weekend.